Simple and Reliable. When the wrench's preset torque value is reached, a simple and reliable mechanical operation inside the handle produces a click you can hear and feel, alerting you to stop applying force. Easy-to-Read Scale. Laser etching of double-range calibration, no matter how long, will not wear, always easy to read. All-Steel Construction. Built for consistent performance and years of dependable service, the mechanical design doesn't need batteries, and the all-steel construction has no plastic parts to break or wear out. Ready to Use. Reversible ratchet head drives in both directions. Ships pre-calibrated to +/- 4% accuracy and ready to use. Sized for cars, trucks, and lawn and garden equipment, the dual-range 10-150 ft.-lb. 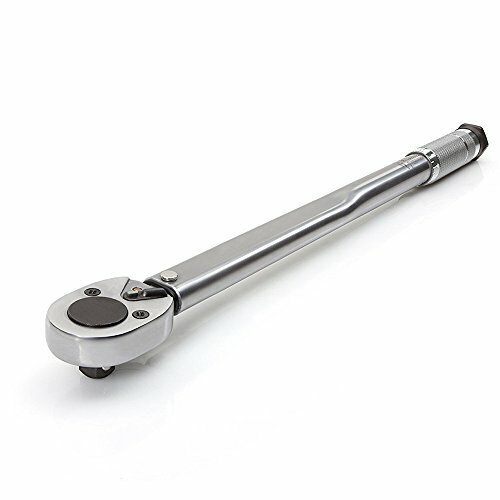 (13.6-203.5 Nm) EvZ 1/2-inch Drive Click Torque Wrench lets you confidently tighten fasteners to precise specifications, ensuring parts are properly secured without being damaged.